Richard Haughton, 37, is one of the match officials on duty this weekend for the Commonwealth Games Sevens at Robina Stadium on the Gold Coast. Haughton won a silver medal at the 2006 Games with England in Melbourne and the 14-strong team contains other referees with high-level playing experience in Australia’s Damon Murphy, a bronze medalist in 2006, and Rebecca Mahoney, a double Women’s World Cup winner with New Zealand. A former winger for Saracens, Wasps and Perpignan, Haughton scored more than 100 tries for England on the Sevens World Series before making his refereeing debut in the competition last season. My parents were living in Zambia when I was born. My mum, Pat, taught midwifery and my dad, Roy, is a chartered accountant and at that time was financial controller for the Zambia government. He later did an MBA in Canada but by my fifth birthday we were back in England. We were a sporty family. Dad played all the sports he could well into his 50s and Mum, who’s Jamaican, did sprinting and cricket. My sister, Alison, was good at athletics. I wanted to be like Jerry Guscott. I grew up in Surrey and played rugby at Sutton & Epsom RFC, with the U9s. For most of my junior rugby my position varied depending on my skill level that day. I enjoyed rugby in the winter and athletics in the summer. I worked a lot with my sister’s athletics group on sprinting technique. I studied at the British School of Osteopathy in London. I passed year one but then they changed the course, so I stopped to pursue a rugby career. I was in the Saracens Academy from 16 and made my Premiership debut in 2000 at Kingsholm. My first day at Sarries was also Tim Horan and Thomas Castaignede’s first day. Alan Zondagh gave me my contract but I also played under Francois Pienaar, Buck Shelford, Alan Gaffney, Eddie Jones and Brendan Venter. It was an unsettled time with coaches changing almost year on year. Sarries was like a second home for me. When I left in 2010, we had an end-of-season dinner and it was very emotional. It was quite hard getting through the speech. I have so many good memories from that time. I left because I wanted to play more. Alex Goode had become first choice at full-back and you can see what he’s done for Sarries and England. I joined Wasps at an interesting time – they were in financial turmoil and in my second year we only just avoided relegation. I played one game for Jersey. I’d agreed a contract at Perpignan but the board vetoed it. So I joined Jersey on the understanding that if anything came up I could leave. I trained with them for six weeks and played a friendly against Leicester. Perpignan then signed me as a medical joker. The player they had signed instead of me, Sofiane Guitoune, did his knee. Because of finances, when he came back I wasn’t allowed to play. For the last six to eight games of the season I just trained. France was a magical experience. In my first game we lost props Nicolas Mas and Kisi Pulu injured in the first ten minutes and had to play with 14 men for 70 minutes away to Clermont. But the team played with so much passion and spirit, scoring four tries (in a 53-31 defeat). I suffered a huge gash against Munster. I made a tackle and my team-mate Sébastien Vahaamahina was competing for the ball and accidentally stepped on my head. I had 13 stitches inserted in my forehead. When Perpignan got relegated I wasn’t offered a new contract. I was flying home for Christmas and bumped into the club president and he said he was looking for new opportunities for me. That’s how my refereeing journey started. Mathieu Raynal helped get me placed with the Catalan referees’ society. We shared the same physio at Perpignan. My first game as a referee was an internal U16s game at Seret, a village team south of Perpignan. I was thrown in at the deep end a bit but it went okay. I received three yellow cards as a player. All for technical offences. I spoke a lot as a player. Because I was at full-back I could say what I wanted because the referee couldn’t hear me! Shadowing a referee for a ProD2 game was an eye-opener. I listened to what he told the assistant referees and the teams. You need a single focus, exactly the same as a player. You need to be an athlete and get around the park just like a player. I’m not surprised more ex-pros don’t become referees. There doesn’t seem to be the money and pathway to bring them through. Unlike with coaching jobs, you have to start at the bottom and it’s expenses only until you reach higher-level rugby. I worked for a marquee hire company last summer (2016). I also did a bit of coaching at Harrow School. I came back to England last June and joined the Herts referees’ society. Now I’m a sales manager for Saracens. I applied for a job as a community coach there but they put me in sales instead and I started in October. They’re happy to accommodate my refereeing. I’ve refereed up to Level Five in England. That is clubs like Colchester, Dorking, Chichester. I’ve also refereed academy games and at sevens tournaments like Amsterdam, Exeter and Sevens in the City. When I did an East Grinstead game, one of their props was Adam Halsey, who I was with in the Saracens Academy. It can be quite a lonely lifestyle. As a player you’re one of a team of 20 or 25 people and travel on a coach. As a referee, you might drive to Newcastle on your own and be on your own in a hotel. That’s why I enjoy the sevens so much – it’s more social, like at Bury St Edmunds with 14 refs in a tent. At National Two up you have professional assistant referees and someone else with the mic, so it’s more of a team environment. I’ve twice sent off a player. One was in a school game for a stiff-arm tackle to the neck, the other was a kick to the face in a National Three game. There are no cameras or TMO, so for something like a tip tackle it’s difficult to give a red card if you’re unsure where the player lands. You have a different type of nerves to playing. For big games you’ve got to be on your mettle, but that excitement helps focus you. My speed is still good. I refereed an England Sevens session ahead of Dubai and when Dan Norton opened up I had to stay with him. You don’t need to bulk up as a referee. You just need to be aerobically strong. I’m doing four legs of the Sevens World Series. I did Dubai and South Africa last month, and have Paris and London to come. I played for six years on the series (2000-06). You learn so much from being on the series that you can bring back to 15s. I’m married to Alicia, who’s a teacher. We’ve been together 14 years. We have a two-year-old son, Florian, and live in St Albans. We got married in 2011 in Cheltenham at The Daffodil, a former art deco cinema converted into a restaurant. My favourite holiday was Fiji. It was so relaxing and we learnt a lot about local culture. I wondered how long it would be before someone recognised me and the answer was half an hour! Even taking an internal flight to a small island you bump into other players. I’ve got a photo of me with Linford Christie. I was at what is now the Linford Christie Stadium when he turned up to train. He got mobbed. I’ve got a picture of him signing an autograph and I’m sticking my head in at the side! I’m trying to be a better ref in January than I was in December. That’s my mentality – competing and trying to learn as much as possible. I’m taking refereeing one stage at a time and seeing where it takes me. I’d love to be offered a professional contract. If I’m the right candidate I’ll progress up the pyramid. 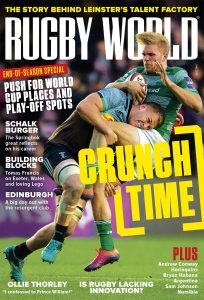 * This article was published in the February 2017 issue of Rugby World. For details of the Commonwealth Games Sevens schedule, click here.